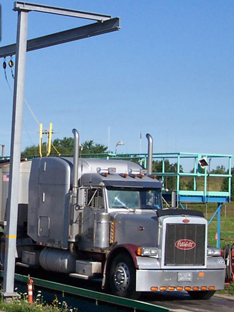 Modular Access Systems, LLC offers I-Beam systems that can be adapted to fit existing loading and unloading stations. We offer replacement lifeline body harnesses and retractable lifelines. These lifelines offer fall protection from end to end, offering solutions otherwise not available. Single or multiple line systems. Economical solution to multi-car access. Can be configured to meet your specific requirements. Utilizes a self-retracting lifeline to allow freedom of movement. 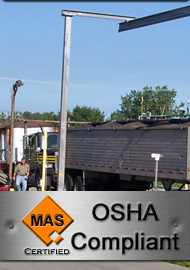 Meets and/or exceeds all applicable OSHA standards as we interpret them. 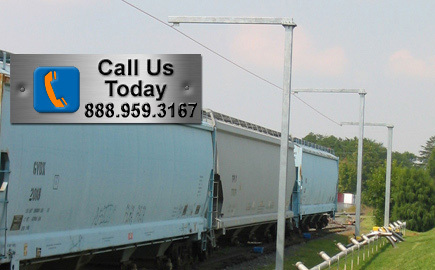 Trolley beam systems and lifeline systems are commonly used for hopper car access. These systems are usually used for long spans of hopper cars in order to open the hatches for loading and unloading. More often than not, clients will use lifeline systems for this application due to cost restraints. A lifeline uses fewer supports than a trolley system. Fewer supports equates to fewer foundations and that means lower cost. A lifeline system does have some deflection and as a result, we do not recommend them for trucks. They are, however suitable for hopper car access because of the height difference. No lifeline or trolley beam system should be used over a flammable product due to the hindrance of fire egress. Trolley beam systems are very well suited to access hopper trucks and for tarping applications. They are a cost effective method for providing fall protection for a truck that needs to be traversed or have multiple hatches opened or closed. We do not recommend lifeline systems for truck applications due to the deflection caused by a fall with a wire system. However, a trolley beam is very rigid and the arrest is immediate, so it is very suitable for truck applications.